"THEY'RE CAMPING ALREADY. WE NEED TO LEAVE EARLIER. I HAVE FOOD." One of the many texts from my mum Thursday morning. Minutely updates about the number of people there, weather, what we were taking, who was going etc filled my inbox pretty quickly and I gave up replying in the end. I had a whole day of school to get through first before I even thought about the wedding, and of course it felt like time was playing with me. That clock definitely said 1:15 last time I checked, not 12.50. And even when school did finish, we still had to go into Brentwood to get a flag (ended up being a teatowel) and.........MY IPHONE 4. But I won't dwell on the AMAZINGNESS that finally getting it was, because obviously the prospect of going up to London overnight was obviously much more exciting. Obviously. Ahem. But seriously, I was really exciting about going up. I already had a feeling about what it could be like from the Moonwalk last year, but I definitely wasn't prepared for what hit us when we got to Buckingham Palace. We left home at 6:30, 4 hours earlier than we were going to, and the whole journey was surprisingly quiet. The only inkling of Royal Wedding mania was waiting for the tube and spotting these cuties.. Even stepping out of St James' Park station was quiet. It wasn't until we turned a corner towards Buckingham Palace that we saw the first preparations. Police vans lining the streets. Everywhere. Army everywhere. Guns everywhere. I felt guilty and had to tell myself that I haven't done anything wrong. The atmosphere hit us straight away when we reached the Palace and the sea of colour was incredible. We had to fight our way down the to the Mall as the area around the Palace got even more packed by the second, and when we finally grabbed a spot we heard people say it was impossible to get down there now. If it was this bad at 7:30 then what's it going to be like this time tomorrow? After fighting with a Spanish tw*t who had a go at me for stepping on his rug (mum found this hilarious) we found a better spot opposite Clarence House. Our neighbours were BRILLIANT. A mother and daughter from Staffordshire, a big family from Pontefract and 3 students from South London. We were given a flag straight away by the students "JANICE AND LOUISE YOU'RE FLAGLESS. HAVE A FLAG." and we soon realised that we were a tad unprepared. Everyone had tents, chairs and sleeping bags. We had a blanket. It got VERY cold by 11pm. If it wasn't for the excitement and brilliance of the night I would definitely have died. MAJOR NEWS AT ABOUT 10PM THOUGH. William and Harry came out to say hello to the crowds. MENTAL. Obviously we were on the other side and surrounded by police, but I saw Harry. 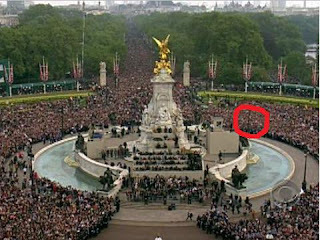 Camilla also waved to my mum. Definitely just to her. Def. No one stopped all night. People singing, dancing, running up and down, taking photos. It was such a sight that we didn't have a chance of sleep. The students ordered pizza for us all and we sat munching while photographers shoved cameras in our faces. It was like being a bloody zoo. Mum went to the loo at, like, 2am, leaving me shivering alone gazing longingly at people in sleeping bags, but being amused by the students in their tent singing Killer Queen. I ate a massive slab of dairy milk, just because I could. And skittles. Morning began to show at about 4:30, and tents had to be down by 5am. With the extra room we were now right at the front and the streets were now packed with people who were just arriving. News crews were walking around interviewing us and the posh police with white gloves started to take their place. They even had a little lunch with them, bless. Prawn mayonnaise sandwich, an apple and Walkers crisps. Satisfactory. Could have done with a Jaffa Cake bar. I won't lie, between 7am and 10:30am I was bored to tears. Nothing was happening. The odd posh car would go past and a street cleaner but that's as good as it got. And there were so many people at this point that movement was impossible. I could barley wiggle my toes and I got SERIOUS pins and needles. Torture. HOWEVER as I began to use my flag for surrendering purposes and not patriotic, William and Harry came out. FINALLY. Then the rest of the gang soon followed and it was flashy flashy a-go-go trying to snap them. But when it came to Kate, we didn't want to take photos because we realised we were THERE and we could see her with our own eyes. We didn't need to take photos. We're not going to forget it are we? And everyone at home will been seeing her at the same time as us. So we just watched. And when she came past I was literally :O at how stunning she looked. The dress! Want please. She looked so happy and Pippa was PHWOAR and the bridesmaids were AWWW and the Queen was such a cutie in yellow. The service was relayed to us and we all joined in with the hymns. Well, I waved my flag in time to the music and asked a lot of questions about what on earth was going on. The archbishop's (it was an archbishop right?) voice worried me a tad. He'd make a smashing action movie voiceover. Everyone cheered when they both said "I will." and belted out the National Anthem at the end. Wooooo. Then panic started to set in with the police as it was open carriage time. The gun police had their serious faces on and the soliders now lined the streets with them. I had great joy in singing the Cha Cha Slide as they moved into position. Hilarious. but didn't have a view of the balcony at all. It was verging on scary to be honest, as we were getting crushed and the sun came out to heat us up. Little kids began crying in panic (WHY BRING KIDS??? There were BABIES and BUGGIES. WHY???) which was awful to see, but as they were being lifted over barriers by police, some were shouting "Why are they allowed over and we're not?!?" Er, HELLO, little children crying and panicking. Behave. Well we saw the planes and knew when the kisses happened by the cheers, but we saw nada. We ended up in St James' Park for lunch, after a battle for freedom and losing mum. The sight was now not as brilliant, but quite horrific. There were no bins anywhere because of bomb threats, so we were LITERALLY (and I can't express how really literally) wading through rubbish up to our ankles. It was AWFUL. I couldn't wait to get out. I felt like a right tramp. But mum being mum insisted on staying for when William and Kate went back to Clarence House, and I admit that seeing them drive slowly in that Aston Martin was so brilliant. We were by the Palace now, by railings, so they were a lot closer to us than before which was a bit surreal. The whole day was surreal. We fought our way back to the station and collapsed on a tube reading the Evening Standard, and seeing the bits we didn't see. Looking back on it now, we were mental not bringing sleeping bags and going up overnight. But I would do it all again in a heartbeat. And do you know what the best part of it was? When I got back on twitter and facebook that night, my whole feed was beaming with pride and was so in love with the whole day. A totally different feed to the day before when no one gave a monkeys. My friend actually said to me that she turned it on to see the dress but couldn't tear herself away and watched the whole thing. Now I don't feel so mental. Your turn Harry. I'm so going to Harry's wedding! Now, this is serious business. How did you persuade your mum to get you an iPhone 4? I want a phone on a £37 contract which will then go down to £21.50, but she is like "no I'm not paying £37" and I am not impressed, but I *need* that phone so I need to persuade her before Friday when my current contract ends. 3 network. £99 for handset. £30 a month for unlimited texts, 300 minutes, 1GB internet.